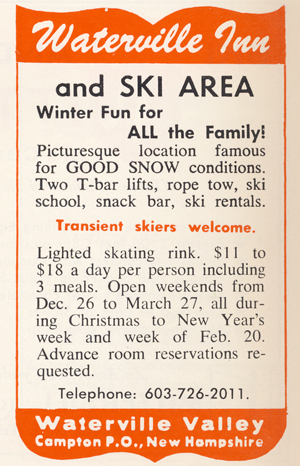 A 1953 advertisement for Snow's Mountain advertised their new T-bar lift. 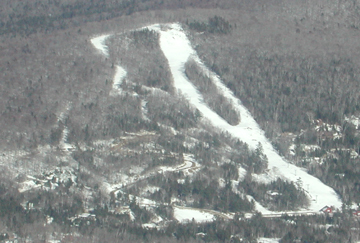 Snow's Mountain is a historic, long-lasting ski area located in Waterville Valley, New Hampshire. 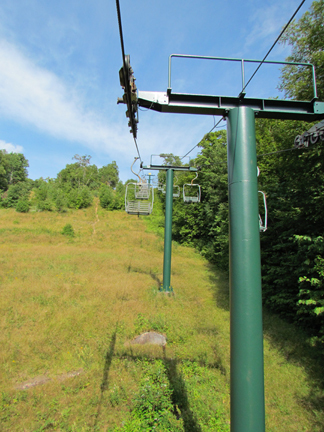 The area has operated in several distinct phases - from a pre-World War II rope tow, to a growing area in the 1940's into the early 1960's, to an "overflow area" of Waterville Valley into the early 1970's, to a closure, to a reopening as a weekend/holiday chairlift area, to a snowboard only mountain, to a multi-decade closure - and now to a reopening scheduled for February 28, 2015. The origins of Snow's Mountain can be traced back to the mid 1930's. 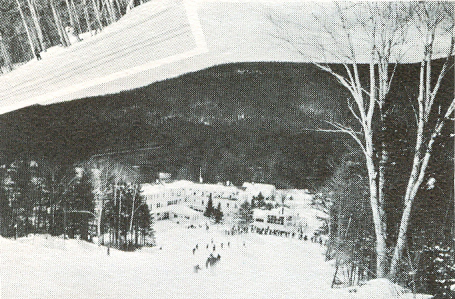 Starting with the 1935-1936 ski season, open slopes with instruction were available to skiers behind the Waterville Inn. 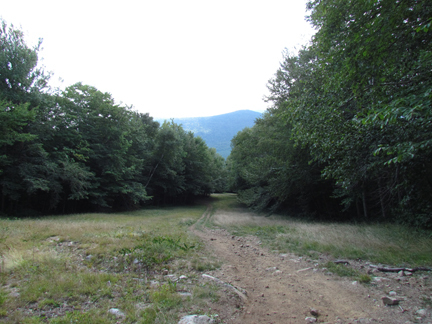 More difficult, non-lifted served trails were available on surrounding mountains, including where the Waterville Valley ski area would eventually develop. By the late 1930's, the open slopes were called the Greeley Pastures, and by 1941 were lit at night. A Greeley Pasture Trail was cut near the slope, and was 15' wide. This likely became the Elbow Bender trails. Left - a 1962 brochure, courtesy of NewEnglandSkiHistory.com. For the 1941-1942 season, Edward Romeo of the Waterville Inn installed a 1000' tow on the Greeley Pasture Slopes, allowing for lift-served skiing for the first time. It is possible that the area closed during World War II, but by the mid 1940's it resumed full operation. According to The Town at the End of the Road, a history by Grace Bean in 1948, Lowell Massachusetts native Ralph Bean purchased the Waterville Inn. Bean had previously seen Waterville Valley while he was a student at Governor Dummer Academy, and visited the Valley again after World War II. Beginning in 1946, after becoming enamored with the area, he obtained a job driving a truck for the Waterville Inn, and operated its ski slope in 1947, when the tow was lengthened to 1500', and the slope expanded up the mountain. After purchasing the area, he needed additional staff, and hired Ray Brox from Dracut, MA who had operated the Kenwood Ski Slope there. Harry Pollard, who would later lead the Ski Patrol at the area, was the one who brought Brox to the Inn. By 1950, the Waterville Lift Corporation was formed, which was founded by Bean, Pollard, Brox, Clarence Lund, and Fred Rust. Bean would run the Inn, while Brox would operate the ski area. They gradually made improvements to the area over the next few years. Other activities, including ice skating and tobogganing were added. A shorter, 400' beginner tow was installed on what would later be known as Little Dipper and then the runout of Bean Bender. 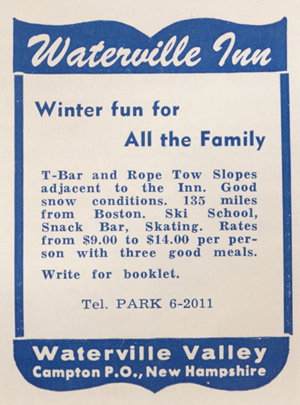 Right - an ad from 1958-1959 shows the facilities at the Waterville Inn ski area. In 1952, the first votes in the nation for the Presidential Primary were held at the Waterville Inn. Ralph Bean was town clerk, and a large snowstorm made it difficult for residents to reach Town Hall, so it was held at the Inn. All the votes went to Eisenhower. A significant expansion occurred for the 1952-1953 season, when a six year old T-bar from Winter Park, Colorado was transported across the country. Brox had heard that the lift was available, and did most of the re-assembly. 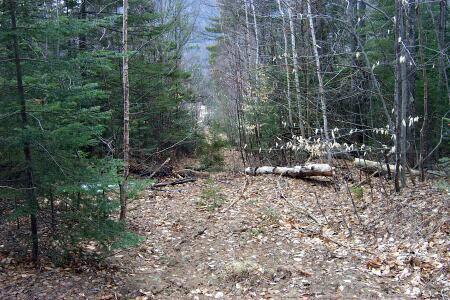 As the top 460' of the T-bar was on National Forest, a special permit was required. 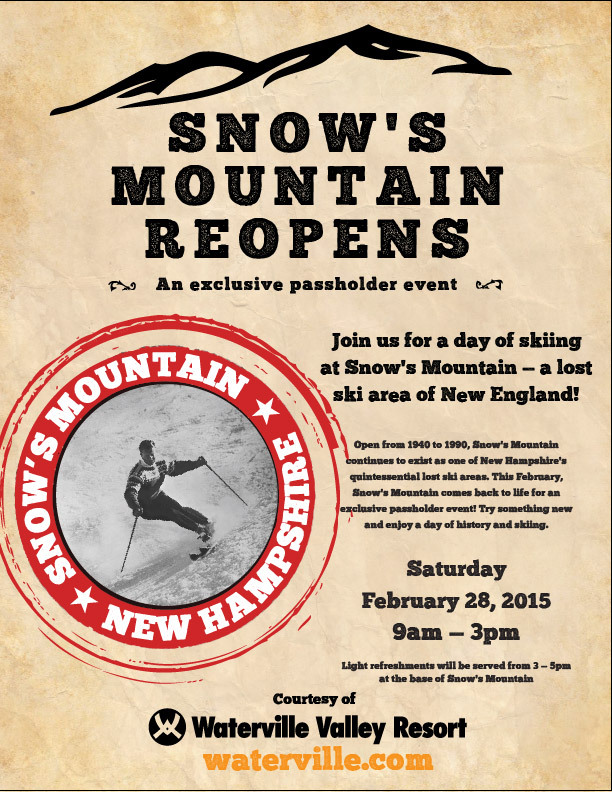 This was one of the first major ski lift relocations in the country's history. 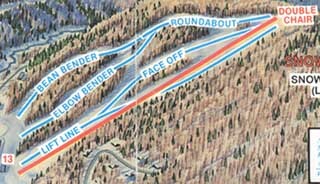 The T-bar expanded the vertical drop to 400' and was reported to be 2300' in length, but using modern measuring techniques via Google Earth was really closer to 1600' with a 340' drop. This T-bar had a telescope tube and large springs, and often lifted smaller skiers off the ground. 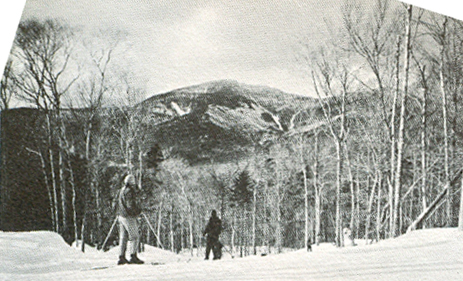 Left - the lower slopes at Snow's Mountain circa 1962, from a brochure courtesy of NewEnglandSkiHistory.com. In the late 1950's, the area switched to a holiday and weekends only operation, and lift tickets were up to $3 (about $24 in today's dollars). For the 1959-1960 season, a second T-bar was constructed to the summit on Forest Service land, along with a few new trails, expanding the vertical drop to nearly 580'. This was unusual for a small ski area to have two relatively short T-bars to the summit, but did give the skier a few options - stay closer to the bottom, access the upper mountain trails, or ski the entire mountain. One of the new trails at the top, the upper portion of Big Dipper, later known as Face Off, had a very steep but short headwall, according to several skiers. A Tucker Sno-Cat was also purchased, one of the first in the country, in order to improve grooming. This Sno-Cat also took skiers to the Tecumseh Trail across the Valley, which was not lift served at the time. 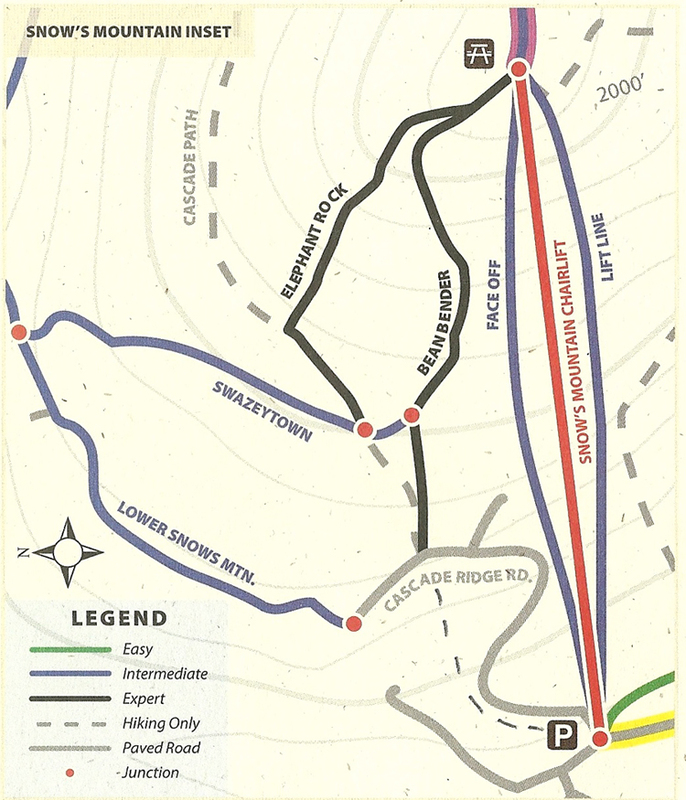 Right - a 1962 trail map, showing the two T-bars and beginner tow. The trail names reflected a space theme at this time. 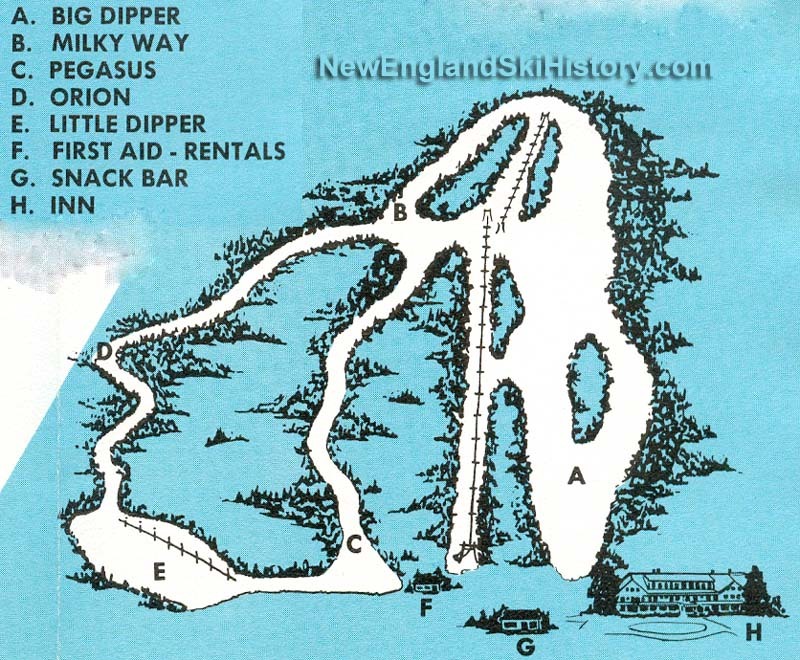 Courtesy of NewEnglandSkiHistory.com. Click for larger version. The area continued to plug along into the mid 1960's, but it would not be long before its small size and relatively limited ski terrain began to make it obsolete. 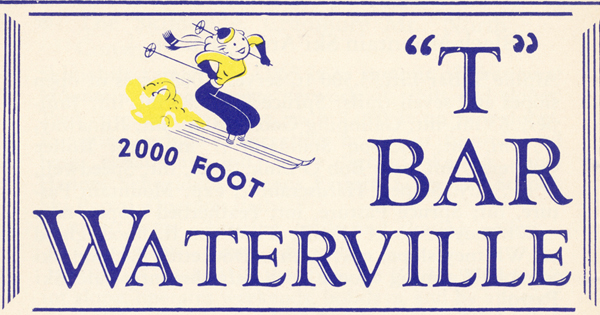 Waterville Valley Ski Resort opened just across the Valley for the 1966-1967, and it is believed that they took over the ownership of the ski area during this time, as Bean had sold the Inn in 1966. 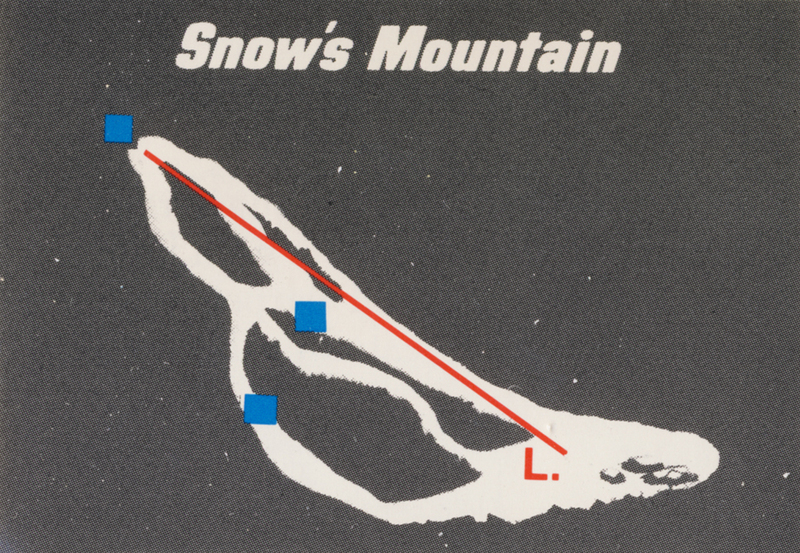 For the first seaon, it was estimated that 10-15% of the total skiers in Waterville Valley were using Snow's Mountain, according to a 1967 report from Sno-Engineering provided by the New England Ski Museum. Tragedy would hit the Waterville Inn of February 23, 1967, when a fire broke out and destroyed the entire building, except for chimneys and a small snack bar for the ski area. 150 skiers were evacuated, and lost all of their belongings. The Inn was not rebuilt, ending an era. 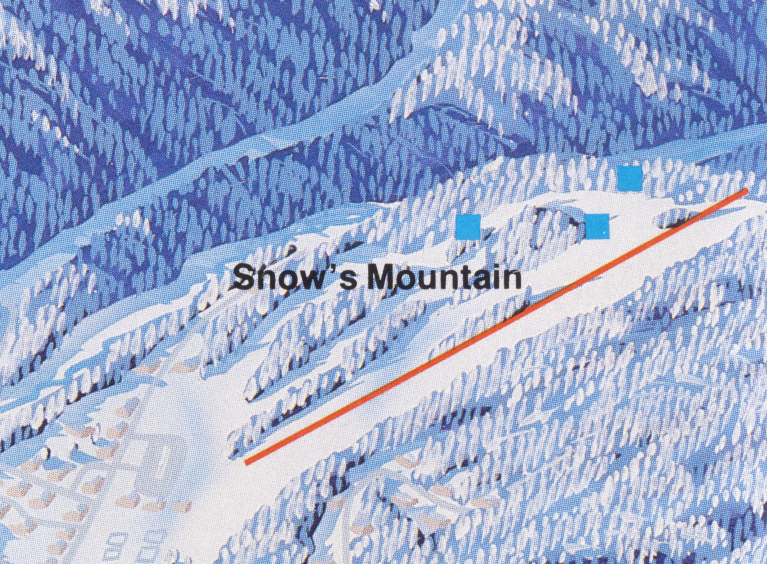 However, the ski area would continue to operate, and was then renamed Snow's Mountain, reflecting the actual name of the ridge it was located on. The rope tow was no longer in operation by the later 1960's. From the Sno-Engineering report, the potential for Snow's Mountain was explored by Sno-Engineering in the summer of 1966, where potential new trails and slopes were laid out (but never cut). A good amount of the land extending south along the mountain was on property owned by the Waterville Company, which would make development easier. 8 lifts with a capacity of 7000 skiers per hour were planned. The terrain had a potential for 40% novice, 40% intermediate, and 20% expert - an easier mountain to balance out the more difficult terrain on Mt. Tecumseh. The potential was compared to Buttermilk in Aspen or Dollar Mountain in Sun Valley. 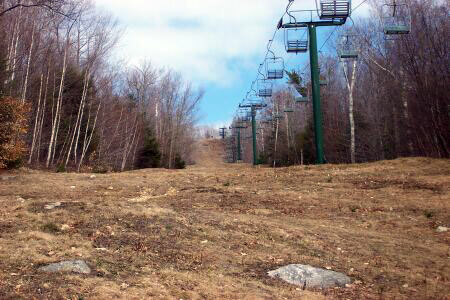 The present state of the ski area emphasized that it was not up to modern standards. The lifts were not laid out to their full advantage, and the terrain was minimal. These ambitious plans for Snow's Mountain were not to be. While Snow's was now an overflow area for Waterville, its limited terrain, especially compared to Mt. Tecumseh led to less use, and the area likely closed from 1972-1974. 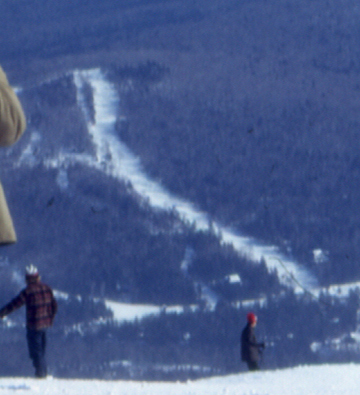 Left - a cropped view of Snow's Mountain from Waterville Valley, likely late 1960's, courtesy of Don Cosgrove. You can see the Big Dipper Slope on the right, and Pegasus, later known as Elbow Bender to the left of this. Note that upper T-bar line also visible. Click for larger version. Even with this closure, Waterville Valley, led by President Tom Corcoran, saw potential again for the area, and a new base to summit chairlift was constructed for the 1974-1975 season, leading to its reopening. The obsolete T-bars were removed and the upper one became part of Face Off.. 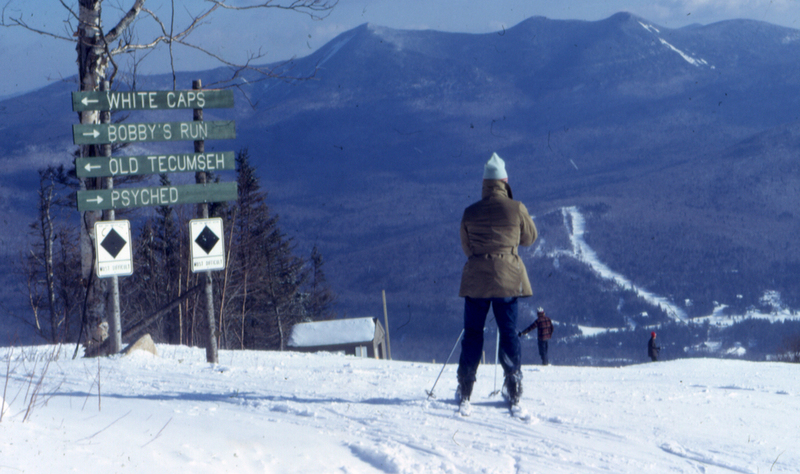 In a January 22, 1975 article in the Day Newspaper, Tom Corcoran was quoted as saying , "Snow's Mountain is the older ski area in Waterville Valley and daytime skiers simply prefer the newer facilities on Mt. Tecumseh even though skiing on Snow's Mountain has always been a bargain. Now this winter the older area takes on new interest at night, especially Tuesdays, when we hold a demonstration and torchlight parade put on by the ski school, complimentary gluhwein and fast-paced broomball game on the hockey rink." But that was about it for improvements and expansion at Snow's for about 20 years. The area operated weekends and holidays only, and eventually the night skiing went away. Snowmaking was never installed which also limited its operation, and a due west exposure didn't help to keep snow on the mountain. Plans were made to expand the ski terrain southward along the ridge, but this never occurred. 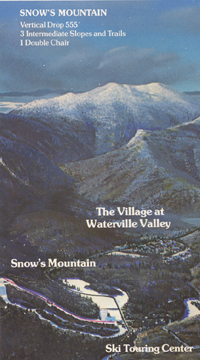 Right - a 1979 Waterville Valley brochure shows Snow's Mountain. Click for larger version. 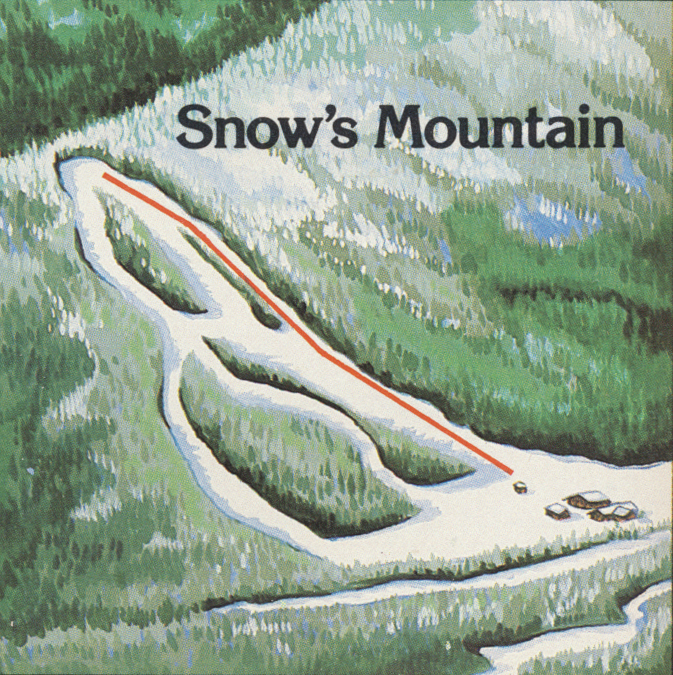 In January of 1994, the author skied at Snow's Mountain, for the first and only time with his friend Doug LeClair. There was a tremendous amount of natural snow on the ground, and the trails were not groomed. Bean Bender and Elbow Bender were enjoyed the most due to their narrowness. The crowds were limited, especially as compared to Waterville Valley. 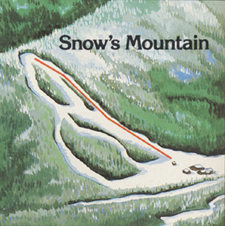 For the 1995-1996 season, Snow's Mountain operated as a snowboard only mountain, complete with a park and half-pipe. It was the hope that the area could stand on its own with these new parameters, but it was not to be, and the area closed at the end of the season. 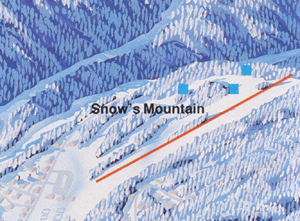 Left - a 1990 trail map shows the 5 intermediate runs at Snow's Mountain. In the early 2000's, homes were constructed on Elbow and Bean Bender, rendering them no longer skiable, but other trails were left intact. Through 2015, Snow's was no longer used for skiing - but instead found new life for mountain biking and sightseeing. The Waterville Valley Academy used the base lodge for their own purposes. 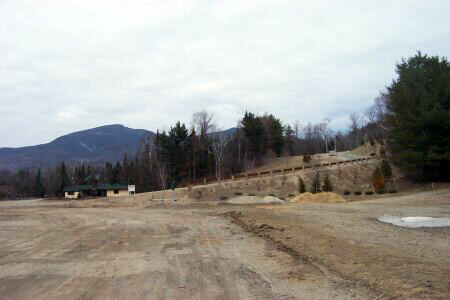 Right - a view of Snow's Mountain in March of 2003 from Waterville Valley. 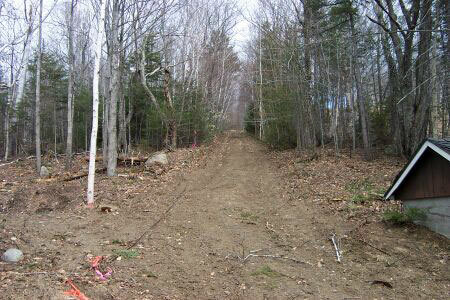 Note the construction on the Bean and Elbow Bender trails. Click for larger version. In early 2015, Waterville Valley made plans to reopen the area for one day, February 28, for season passholders only, in a special event. The double chair and 2 trails will be open for skiing. We will have a report on this following the event. Left - the poster for the event, click for larger version. 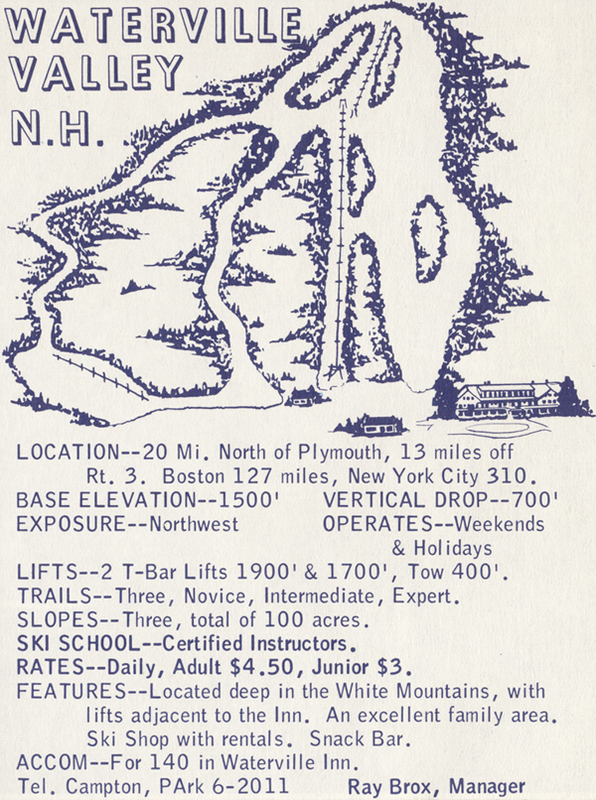 Above - a 1966 trail map/ad from The National Survey Ski Atlas. Click for larger version. 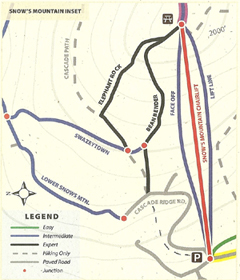 1977 trail map. Click for larger version. Liam "Lime" Moya. Click for larger version. 1965-1966 advertisement in a NH Winter Guide. One of the narrow trails looking towards Mt. Tecumseh, 1962. Courtesy of NewEnglandSkiHistory.com. In 2003, Rivercoil from The Snowway visited Snow's Mountain and took the following photos, showing the ski area prior to the development of homes. Bottom of Elbow Bender. Lower portions of Bean Bender, now a road. This was the former location of the beginner area. Bottom of double chair. 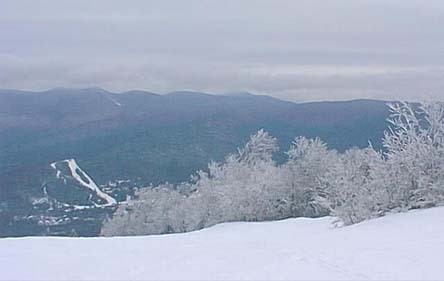 Lower portions of the chair looking towards Waterville Valley. Former halfpipe as well as the lower portions of the former lower T-bar. Looking down the Lower T-bar lift line, cables still present. Looking up the rest of the lower T-bar liftline. 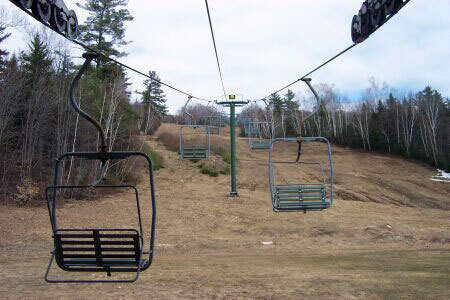 Upper portions of chairlift. Liam "Lime" Moya took these photos while mountain biking in 2011. Click on each for a larger version. Riding the chairlift. Roundabout trail. 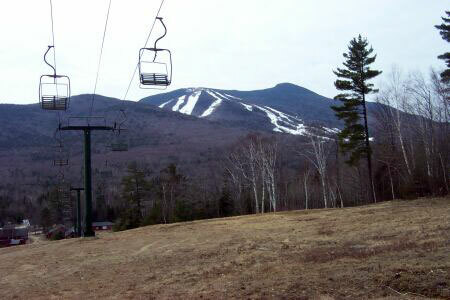 Snow's Mountain in 2001 from Waterville Valley, courtesy RSN. Early 1990's Terrasever view of the ski area. Stu Pollard: My dad, Harry, and others started Snows in '48 and he was the head ski instructor for 15 years and is a Ski Hall of Famer since '76 and was the national ski patrol director for 16 years. Matt Schwoegler from 2001: The double chair is still very much in operation and is used as a mountain biking lift during the summer. Parts of the old rope tow can still be found in the woods along with the towers. The line is becoming overgrown though. Your reason for Snow's closing based on snowmaking is pretty accurate. WV management felt that it wasn't economically feasible to run the area. However, the mountain biking operation has brought new life into what was almost left to rust. WV still maintains the lift and the runs. They are mowed every fall. I think there may be plans to develop some of the smaller runs on the north side of the area into housing. But this is not confirmed. 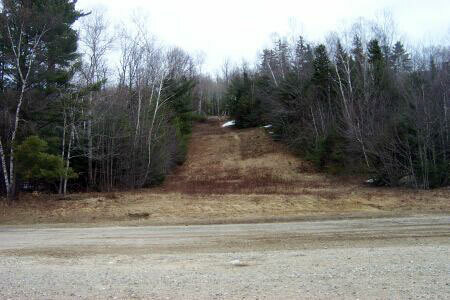 However, the hill as a mountain biking area should remain for years to come. Bob Hatcher: The Waterville Valley ski area, just before the Tom Corcoran era of ownership ended in the late 1990's, tried to market Snow's Mountain as the world's first snowboard-only mountain. The entire mountain was developed into a park with tabletops and other snowboard-friendly amenities. Unfortunately snowboarders preferred the larger Waterville ski area across the valley, the plan failed, and Snow's became a summer-only mountain. BRichelson: The best thing about Snow's Mt. was the T-Bar lift. It would literally lift any kid under say 80lbs into the air and you could almost ride up like a chair lift the entire trip. Each T-bar was two telescoping pipes spring loaded hanging from the cable. The springs were very strong, sized more for an adult. We would race down the slopes as fast as we could just to get in as many rides as possible. Alan Packard: The area provided night skiing for folks staying at Waterville who couldn't ski enough during the day. A good steak restaurant existed in the base lodge. 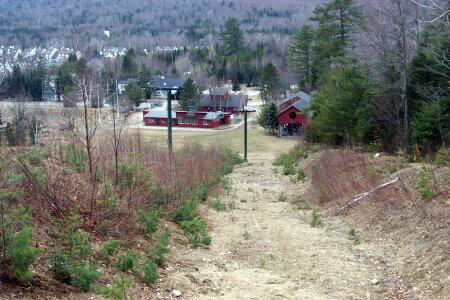 On Snow's Mountain (NH) - The old Waterville Inn burned down in 1967 and was never re-built. I think it had burned down once before. We stayed there several Feb vacations in the early 60's. I addition to the 2 T-bars that pre-dated the existing chairlift, there was also a rope tow on the far left (trail map view), which was later (~1970) morphed into a "Pony Lift," which was basically a rope tow with handles. The trail "Upper Big Dipper", which is now the upper portion of the main trail under the chair, actually had what would now be a black diamond drop at its top section. It was all lit for night skiing, and I actually skied it often on peak weekend afternoons in the early 70's when the lines at the Mt Tecumseh part of Waterville Valley would be unbearably long. There were plans at that time to extend the ski area to the east (right on the trail map) where there were several hundred feet of additional elevation, but nothing came of them, due partially at least to the southern exposure. Eileen McCrory: I spent a great deal of time in Waterville Valley NH in the 70's and 80's for downhill and cross country skiing. In the 80's telemark skiing became popular (downhill on cross country skis). Snow's was a great place for telemarking. We would take the cross country trails up the back of the mountain and ski down the slopes of Snow's. (You could also take a trail up the side of Waterville Valley Ski Area and ski down it's slopes but it was a much longer trail to get to the downhill slope.) Snow's would let the cross country skiers take the lift up for $1. I think they ended up offering a discounted lift ticket for cross country skiers. I remember getting Snow's lift tickets for cross country. There were days where all the skiers at Snow's were telemarkers. 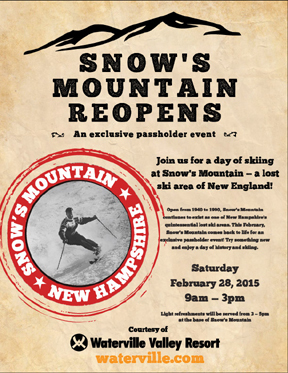 More information on Snow's Mountain at NewEnglandSkiHistory.com.